dQdt. This is because the amount of heat crossing through any cross section is a function of many variables like temperature difference, area of cross-section, etc. So, we cannot write it as a complete derivative with respect to time. Does a body at 20°C radiate in a room, where the room temperature is 30°C? If yes, why does its temperature not fall further? Yes, the body will radiate. However, its temperature will not fall down with time because as the temperature of the surroundings is greater than the temperature of the body so, its rate of absorption will be greater than its rate of emission. Why does blowing over a spoonful of hot tea cools it? Does evaporation play a role? Does radiation play a role? Here, major role is played by convection. When we blow air over a spoonful of hot tea, the air coming from our mouth has less temperature than the air above the tea. Since hot air has less density, it rises up and cool air goes down. In this way, the tea cools down. We know that any hot body radiates. So, the spoonful of tea will also radiate and as the temperature of the surrounding is less then the tea, the tea will cool down with time. Evaporation is also involved in this. On blowing over the hot tea, rate of evaporation increases and the cools down. On a hot summer day we want to cool our room by opening the refrigerator door and closing all the windows and doors. Will the process work? No. When the door of the refrigerator is left open in a closed room, the heat given out by the refrigerator to the room will be more than that taken from the room. Therefore, instead of decreasing, the temperature of the room will increase at a slower rate. On a cold winter night you are asked to sit on a chair. Would you like to choose a metal chair or a wooden chair? Both are kept in the same lawn and are at the same temperature. We will prefer to seat on a wooden chair because as the conductivity of wood is poorer than that of metal, heat flow from our body to the chair will be less in case of a wooden chair. T24 – T14as may be expected from the Stefan’s law? Yes, the temperature of the balls can be equalised by radiation. This is because both the spheres will emit radiations in all the directions at different rates. The ball kept at the temperature of 300 K will gain some thermal energy by the radiation emitted by the ball kept at the temperature of 600 K. Also, it losses energy by radiation. Similarly, the ball kept at the temperature of 600 K will gain some thermal energy by the radiation emitted by the ball kept at the temperature of 600 K. Also, it losses energy by radiation. A time comes when the temperature of both the bodies becomes equal. An ordinary electric fan does not cool the air, still it gives comfort in summer because it circulates the air present in the room. Due to this, evaporation takes place and we feel cooler. The temperature of the atmosphere at a high altitude is around 500°C. Yet an animal there would freeze to death and not boil. Explain. The temperature of the atmosphere at a high altitude is around 500°C, but density of air molecule is extremely low at this height. So, very less molecules of air collide with the body of the animal and transfer very less amount of heat. That is why the animal present there would freeze to death instead boiling. Standing in the sun is more pleasant on a cold winter day than standing in shade. Is the temperature of air in the sun considerably higher than that of the air in shade? The heat coming from the sun to us is through the radiation. On colder winter days, when we stand in shade, we do not get the heat of the sun from the radiation. Though we feel cool in the shade, the temperature of the air in shady as well as non-shady regions is the same. During night, the earth’s surface radiates infrared radiation of larger wavelength. Gas molecules in the air absorb some of this energy and radiate energy of their own in all directions. Also, water molecules, like the vapour that makes the clouds, absorb more frequencies of infrared energy than clear air does. Both these factors contribute to the fact that clouds radiate more heat in all directions (including the earth) than clear air does. In turn, this makes the overall temperature on the earth warmer when there is a cloud cover. The heat energy radiated by the earth is reflected back to earth. Due to this, cloudy nights are warmer than the nights with clean sky. Why is a white dress more comfortable than a dark dress in summer? A white colour dress reflects almost all the radiations falling on it. So, it does not absorb any heat from the sunlight and we feel more comfortable in it. On the other hand, a dark colour dress absorbs maximum radiation falling on it. So, we feel hot in a dark coloured dress during summers. The thermal conductivity of a rod depends only on the material of the rod. For example, metals are much better conductors than non-metals because metals have large number of free electron that can move freely anywhere in the body of the metal and carry thermal energy from one place to other. Also, 2 copper rods having different lengths and areas of cross-section have same thermal conductivity that depends only on the number of free electrons in copper. In conduction, heat is transferred from one place to other by vibration of the molecules. In this process, the average position of a molecule does not change. Hence, there is no mass movement of matter. In convection, heat is transferred from one place to other by actual motion of particles of the medium. When water is heated, hot water moves upwards and cool water moves downwards. In radiation process, transfer of heat does not require any material medium. For a room containing air, heat can be transferred via radiation (no medium required) and convection (by the movement of air molecules) and by conduction (due to collision of hot air molecules with other molecules). This law holds true for all the bodies. In steady state, the temperature of the rod is nonuniform maximum at the end near the furnace and minimum at the end that is away from the furnace. Suppose a body at temperature T is kept in a room at temperature T0. u = eσAT4Here, e is the emissivity of the body. dTdt = -bA(T-T0)This can be obtained from equation (i) by considering the temperature difference to be small and doing the binomial expansion. A hot liquid is kept in a big room. Its temperature is plotted as a function of time. Which of the following curves may represent the plot? T4, where T is the initial temperature of the liquid. As the temperature decreases, the rate of loss of thermal energy will also decrease. So, the slope of the curve will also decrease. Therefore, the plot of temperature with time is best represented by the curve in option (a). T4, where T is the initial temperature of the liquid. As the temperature decreases, the rate of loss will also decrease. So, the slope of the curve will also decrease. Finally, at equilibrium, the temperature of the room will become equal to the new temperature of the liquid. So, in steady state, the difference between the temperatures of the two will become zero. A graph is plotted between the logarithm of the numerical value of the temperature difference between the liquid and the room is plotted against time.The logarithm converts the fourth power dependence into a linear dependence with some coefficient (property of log). So, the plot satisfying all the above properties will be a straight line. (d) less than or more than 5 minutes depending on whether its mass is more than or less than 1 kg. One end of a metal rod is dipped in boiling water and the other is dipped in melting ice. (a) All parts of the rod are in thermal equilibrium with each other. (b) We can assign a temperature to the rod. The heat transfer will take place from the hot end to the cold end of the rod via conduction. So, with time, the temperature of the rod will increase from the end dipped in boiling water to the end dipped in melting, until it comes in equilibrium with its surroundings. In steady state, the temperature of the rod is nonuniform and constant, maximum at the end dipped in boiling water and minimum at the end dipped in melting ice. Equilibrium means that the system is stable. So, all the macroscopic variables describing the system will not change with time. Hence, the temperature of the rod will become constant once equilibrium is reached, but its value is different at different positions of the rod. A black body is an ideal concept. A black body is the one that absorbs all the radiation incident on it. So, a black body does not reflect and refract radiation. Convection current is the movement of air (or any fluid) due to the difference in the temperatures. During summer days, there is temperature difference of air above the land and river. Due to this, a convection current is set from the river to the land during daytime. On the other hand, during night, a convection current is set from the land to the river. Therefore, a mild air always flows on the shore of a calm river due to the convection current. A piece of charcoal and a piece of shining steel of the same surface area are kept for a long time in an open lawn in bright sun. (d) If the two are picked up from the lawn and kept in a cold chamber, the charcoal will lose heat at a faster rate than the steel. In steel, conductivity is higher than charcoal. So, if both are picked up by bare hands, then heat transfer from the body (steel or charcoal) to our hand will be larger in case of steel. Hence, steel will be hotter than the charcoal. On the other hand, emissivity of charcoal is higher as compared to steel. So, if the two are picked up from the lawn and kept in a cold chamber, charcoal will lose heat at a faster rate than steel. A heated body emits radiation which has maximum intensity near the frequency v0. The emissivity of the material is 0.5. If the absolute temperature of the body is doubled. cTνm=bHere, T is the absolute temperature of the body. So, as the temperature is doubled to keep the product on the left hand side constant, frequency is also doubled. This implies that total energy emitted will increase by a factor of (2)4, which is equal to 16. A solid sphere and a hollow sphere of the same material and of equal radii are heated to the same temperature. (b) Both will absorb equal amount of radiation from the surrounding in the biginning. (a) Both will emit equal amount of radiation per unit time in the beginning. (b) Both will absorb equal amount of radiation from the surrounding in the beginning. u0 = eσAT04As the two spheres have equal radii and temperatures, their rate of absorption and emission will be equal in the beginning. A uniform slab of dimension 10 cm × 10 cm × 1 cm is kept between two heat reservoirs at temperatures 10°C and 90°C. The larger surface areas touch the reservoirs. The thermal conductivity of the material is 0.80 W m−1 °C−1. Find the amount of heat flowing through the slab per minute. A liquid-nitrogen container is made of a 1 cm thick styrofoam sheet having thermal conductivity 0.025 J s−1 m−1 °C−1. Liquid nitrogen at 80 K is kept in it. A total area of 0.80 m2 is in contact with the liquid nitrogen. The atmospheric temperature us 300 K. Calculate the rate of heat flow from the atmosphere to the liquid nitrogen. The normal body-temperature of a person is 97°F. Calculate the rate at which heat is flowing out of his body through the clothes assuming the following values. Room temperature = 47°F, surface of the body under clothes = 1.6 m2, conductivity of the cloth = 0.04 J s−1 m−1°C−1, thickness of the cloth = 0.5 cm. Water is boiled in a container having a bottom of surface area 25 cm2, thickness 1.0 mm and thermal conductivity 50 W m−1°C−1. 100 g of water is converted into steam per minute in the steady state after the boiling starts. Assuming that no heat is lost to the atmosphere, calculate the temperature of the lower surface of the bottom. Latent heat of vaporisation of water = 2.26 × 106 J kg−1. One end of a steel rod (K = 46 J s−1 m−1°C−1) of length 1.0 m is kept in ice at 0°C and the other end is kept in boiling water at 100°C. The area of cross section of the rod is 0.04 cm2. Assuming no heat loss to the atmosphere, find the mass of the ice melting per second. Latent heat of fusion of ice = 3.36 × 105 J kg−1. A icebox almost completely filled with ice at 0°C is dipped into a large volume of water at 20°C. The box has walls of surface area 2400 cm2, thickness 2.0 mm and thermal conductivity 0.06 W m−1°C−1. Calculate the rate at which the ice melts in the box. Latent heat of fusion of ice = 3.4 × 105 J kg−1. A pitcher with 1-mm thick porous walls contains 10 kg of water. Water comes to its outer surface and evaporates at the rate of 0.1 g s−1. The surface area of the pitcher (one side) = 200 cm2. The room temperature = 42°C, latent heat of vaporization = 2.27 × 106 J kg−1, and the thermal conductivity of the porous walls = 0.80 J s−1 m−1°C−1. Calculate the temperature of water in the pitcher when it attains a constant value. 0.1 g of water evaporate in 1 sec, so 10 kg water will evaporate in 105 s.
A steel frame (K = 45 W m−1°C−1) of total length 60 cm and cross sectional area 0.20 cm2, forms three sides of a square. The free ends are maintained at 20°C and 40°C. Find the rate of heat flow through a cross section of the frame. Water at 50°C is filled in a closed cylindrical vessel of height 10 cm and cross sectional area 10 cm2. The walls of the vessel are adiabatic but the flat parts are made of 1-mm thick aluminium (K = 200 J s−1 m−1°C−1). Assume that the outside temperature is 20°C. The density of water is 100 kg m−3, and the specific heat capacity of water = 4200 J k−1 g °C−1. Estimate the time taken for the temperature of fall by 1.0 °C. Make any simplifying assumptions you need but specify them. ΔQΔt=T1-T2lkAΔQΔt= 50-30×200×10-310-3ΔQΔt=6000 J/secHeat escapes out from both the flat surfaces. The left end of a copper rod (length = 20 cm, area of cross section = 0.20 cm2) is maintained at 20°C and the right end is maintained at 80°C. Neglecting any loss of heat through radiation, find (a) the temperature at a point 11 cm from the left end and (b) the heat current through the rod. Thermal conductivity of copper = 385 W m−1°C−1. Rate of flow of heat=Temperature differenceThermal resistanceΔQΔt = kA(T1-T2)lΔQΔt = 80-200.2×385×0.2×10-4 = 2310×10-3 = 2.31 J/secLet te temperature of point C be T, which is at a distance of 11 cm from the left end. The ends of a metre stick are maintained at 100°C and 0°C. One end of a rod is maintained at 25°C. Where should its other end be touched on the metre stick so that there is no heat current in the rod in steady state? One end of the rod is at a temperature of 25°C. So, if no heat current flows through the rod in steady state, then the other end of the rod should also be at a temperature of 25°C. Let the point at which the other end of the rod is touched be C.
No heat flows through the rod when the temperature at point C is also 25°C. ⇒ΔTACxkA = ΔTCB100-xkA100-25x = 25-0100-x3x = 1100-x300-3x = x300 = 4xx = 75 cmThus, it should be touched at 75 cm from 100°C end. A cubical box of volume 216 cm3 is made up of 0.1 cm thick wood. The inside is heated electrically by a 100 W heater. It is found that the temperature difference between the inside and the outside surface is 5°C in steady state. Assuming that the entire electrical energy spent appears as heat, find the thermal conductivity of the material of the box. The inner surface of the cube is heated by a 100 W heater. Figure (28−E1) shows water in a container having 2.0 mm thick walls made of a material of thermal conductivity 0.50 W m−1°C−1. The container is kept in a melting-ice bath at 0°C. The total surface area in contact with water is 0.05 m2. A wheel is clamped inside the water and is coupled to a block of mass M as shown in the figure. As the block goes down, the wheel rotates. It is found that after some time a steady state is reached in which the block goes down with a constant speed of 10 cm s−1 and the temperature of the water remains constant at 1.0°C. Find the mass M of the block. Assume that the heat flows out of the water only through the walls in contact. Take g = 10 m s−2. Let the mass of the block be m.
On a winter day when the atmospheric temperature drops to −10°C, ice forms on the surface of a lake. (a) Calculate the rate of increase of thickness of the ice when 10 cm of the ice is already formed. (b) Calculate the total time taken in forming 10 cm of ice. Assume that the temperature of the entire water reaches 0°C before the ice starts forming. Density of water = 1000 kg m−3, latent heat of fusion of ice = 3.36 × 105 J kg−1 and thermal conductivity of ice = 1.7 W m−1°C−1. Neglect the expansion of water of freezing. ⇒lΔt=T1-T2·KAΔQ=K·A T1-T2m·L= KAT1-T2Al·ρω L= 1.7 0-1010×10-2×103×3.36×105=173.36×10-7=5.059×10-7 m/s=5×10-7 m/s(b) To form a thin ice layer of thickness dx, let the required be dt. Consider the situation of the previous problem. Assume that the temperature of the water at the bottom of the lake remains constant at 4°C as the ice forms on the surface (the heat required to maintain the temperature of the bottom layer may come from the bed of the lake). The depth of the lake is 1.0 m. Show that the thickness of the ice formed attains a steady state maximum value. Find this value. The thermal conductivity of water = 0.50 W m−1°C−1. Take other relevant data from the previous problem. Let the point upto which ice is formed is at a distance of x m from the top of the lake. Under steady state, the rate of flow of heat from ice to this point should be equal to the rate flow of heat from water to this point. Three rods of lengths 20 cm each and area of cross section 1 cm2 are joined to form a triangle ABC. The conductivities of the rods are KAB = 50 J s−1 m−1°C−1, KBC = 200 J s−1 m−1°C−1 and KAC = 400 J s−1 m−1°C−1. The junctions A, B and C are maintained at 40°C, 80°C and 80°C respectively. Find the rate of heat flowing through the rods AB, AC and BC. A semicircular rod is joined at its end to a straight rod of the same material and the same cross-sectional area. The straight rod forms a diameter of the other rod. The junctions are maintained at different temperatures. Find the ratio of the heat transferred through a cross section of the semicircular rod to the heat transferred through a cross section of the straight rod in a given time. Let A be the area of cross section and K be the thermal conductivity of the material of the rod. Let q1 be the rate of flow of heat through a semicircular rod. q1 = dQdt=K·A T1-T2π rLet q2 be the rate of flow of heat through a straight rod. Let the temperatures at the ends A and B be TA and TB, respectively. Here, s is the specific heat of the rod and âˆ†T is the temperature difference between ends A and B. Steam at 120°C is continuously passed through a 50 cm long rubber tube of inner and outer radii 1.0 cm and 1.2 cm. The room temperature is 30°C. Calculate the rate of heat flow through the walls of the tube. Thermal conductivity of rubber = 0.15 J s−1 m−1°C−1. Let us consider a cylindrical shell of length l, radius x and thickness dx. dQdt = -KA∆TdxHere, the negative sign indicates that the rate of heat flow decreases as x increases. A hole of radius r1 is made centrally in a uniform circular disc of thickness d and radius r2. The inner surface (a cylinder a length d and radius r1) is maintained at a temperature θ1 and the outer surface (a cylinder of length d and radius r2) is maintained at a temperature θ2 (θ1 > θ2). The thermal conductivity of the material of the disc is K. Calculate the heat flowing per unit time through the disc. dθdtbe the rate of flow of heat. Consider an annular ring of radius r and thickness dr.
dθdt = -K2πrd.dθdrRate of flow of heat is constant. A hollow tube has a length l, inner radius R1 and outer radius R2. The material has a thermal conductivity K. Find the heat flowing through the walls of the tube if (a) the flat ends are maintained at temperature T1 and T2 (T2 > T1) (b) the inside of the tube is maintained at temperature T1 and the outside is maintained at T2. Let us consider a cylindrical shell of radius r and thickness dr.
A composite slab is prepared by pasting two plates of thickness L1 and L2 and thermal conductivites K1 and K2. The slabs have equal cross-sectional area. Find the equivalent conductivity of the composite slab. It is equivalent to the series combination of 2 resistors. Figure (28-E2) shows a copper rod joined to a steel rod. The rods have equal length and equal cross sectional area. The free end of the copper rod is kept at 0°C and that of the steel rod is kept at 100°C. Find the temperature at the junction of the rods. Conductivity of copper = 390 W m−1°C−1 and that if steel = 46 W m−1°C−1. Rods are connected in series, so the rate of flow of heat is same. An aluminium rod and a copper rod of equal length 1.0 m and cross-sectional area 1 cm2 are welded together as shown in figure (28−E3). One end is kept at a temperature of 20°C and the other at 60°C. Calculate the amount of heat taken out per second from the hot end. Thermal conductivity of aluminium = 200 W m−1°C−1 and of copper = 390 W m−1°C−1. q1 and q2 are heat currents. In other words, they are the rates of flow of heat through aluminium and copper rod, respectively. Figure (28-E4) shows an aluminium rod joined to a copper rod. Each of the rods has a length of 20 cm and area of cross section 0.20 cm2. The junction is maintained at a constant temperature 40°C and the two ends are maintained at 80°C. Calculate the amount of heat taken out from the cold junction in one minute after the steady state is reached. The conductivites are KAt = 200 W m−1°C−1 and KCu = 400 W m−1°C−1. Consider the situation shown in figure (28-E5). The frame is made of the same material and has a uniform cross-sectional area everywhere. Calculate the amount of heat flowing per second through a cross section of the bent part if the total heat taken out per second from the end at 100°C is 130 J.
R1 and R2 are in parallel, so total heat across R1 and R2 will be same. Suppose the bent part of the frame of the previous problem has a thermal conductivity of 780 J s−1 m−1 °C−1 whereas it is 390 J s−1 m−1°C−1 for the straight part. Calculate the ratio of the rate of heat flow through the bent part to the rate of heat flow through the straight part. Here, K is the thermal conductivity, A is the area of cross section and l is the length of the conductor. RBE=R2=60×10-2390×ASince R1 and R2 are in parallel, the amount of heat flowing through them will be same. A room has a window fitted with a single 1.0 m × 2.0 m glass of thickness 2 mm. (a) Calculate the rate of heat flow through the closed window when the temperature inside the room is 32°C and the outside is 40°C. (b) The glass is now replaced by two glasspanes, each having a thickness of 1 mm and separated by a distance of 1 mm. Calculate the rate of heat flow under the same conditions of temperature. Thermal conductivity of window glass = 1.0 J s−1 m−1°C−1 and that of air = 0.025 J s−1 m−1°C−1. RA = lKA.AFrom the circuit diagram, we can find that all the resistors are connected in series. The two rods shown in figure (28-E6) have identical geometrical dimensions. They are in contact with two heat baths at temperatures 100°C and 0°C. The temperature of the junction is 70°C. Find the temperature of the junction if the rods are interchanged. As the rods are connected in series, the rate of flow of heat will be same in both the cases. dQdt = KA∆TlRate of heat flow in rod P will be same as that in rod Q. Again, the rate of flow of heat will be same in rod P and Q. The three rods shown in figure (28−E7) have identical geometrical dimensions. Heat flows from the hot end at a rate of 40 W in the arrangement (a). Find the rates of heat flow when the rods are joined as in arrangement (b) and in (c). Thermal condcutivities of aluminium and copper are 200 W m−1°C−1 and 400 W m−1°C−1 respectively. Four identical rods AB, CD, CF and DE are joined as shown in figure (28-E8). The length, cross-sectional area and thermal conductivity of each rod are l, A and K respectively. The ends A, E and F are maintained at temperature T1, T2 and T3 respectively. Assuming no loss of heat to the atmosphere, find the temperature at B. Let the temperature at junction B be T.
Let q1, q2 and q3 be the heat currents, i.e. rate of flow of heat per unit time in AB, BCE and BDF, respectively. Seven rods A, B, C, D, E, F and G are joined as shown in figure (28-E9). All the rods have equal cross-sectional area A and length l. The thermal conductivities of the rods are KA = KC = K0, KB = KD = 2K0, KE = 3K0, KF = 4K0 and KG = 5K0. The rod E is kept at a constant temperature T1 and the rod G is kept at a constant temperature T2 (T2 > T1). (a) Show that the rod F has a uniform temperature T = (T1 + 2T2)/3. (b) Find the rate of heat flowing from the source which maintains the temperature T2. Here, K denotes the thermal conductivity of the respective rods. In steady state, temperature at the ends of rod F will be same. ∆TThermal resistanceFirst, we will find the effective thermal resistance of the circuit. From the diagram, we can see that it forms a balanced Wheatstone bridge. Also, as the ends of rod F are maintained at the same temperature, no heat current flows through rod F.
Hence, for simplification, we can remove this branch. From the diagram, we find that RA and RB are connected in series. RC and RD are also connected in series. Then, RAB and RCD are in parallel connection. Find the rate of heat flow through a cross section of the rod shown in figure (28-E10) (θ2 > θ1). Thermal conductivity of the material of the rod is K.
We can infer from the diagram that ΔPQR is similar to ΔPST. A rod of negligible heat capacity has length 20 cm, area of cross section 1.0 cm2 and thermal conductivity 200 W m−1°C−1. The temperature of one end is maintained at 0°C and that of the other end is slowly and linearly varied from 0°C to 60°C in 10 minutes. Assuming no loss of heat through the sides, find the total heat transmitted through the rod in these 10 minutes. ⇒6010×60°C/sSo, total heat flow can be found by adding heat flow every second. A hollow metallic sphere of radius 20 cm surrounds a concentric metallic sphere of radius 5 cm. The space between the two spheres is filled with a nonmetallic material. The inner and outer spheres are maintained at 50°C and 10°C respectively and it is found that 100 J of heat passes from the inner sphere to the outer sphere per second. Find the thermal conductivity of the material between the spheres. Consider a shell of radii r and thickness dr. Here, the negative sign indicates that the temperature decreases with increasing radius. Figure (28-E11) shows two adiabatic vessels, each containing a mass m of water at different temperatures. 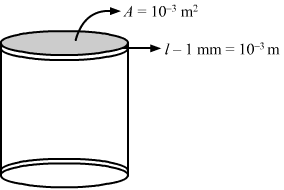 The ends of a metal rod of length L, area of cross section A and thermal conductivity K, are inserted in the water as shown in the figure. Find the time taken for the difference between the temperatures in the vessels to become half of the original value. The specific heat capacity of water is s. Neglect the heat capacity of the rod and the container and any loss of heat to the atmosphere. ∆Q∆t=KAT1-T2lIn time t, the temperature difference becomes half. Heat loss by water at temperature T1 is equal to the heat gain by water at temperature T2. ms(T1-T1′)=KA(T1-T2)l∆t⇒T1’=T1-KA(T1-T2)l(ms)∆tThis gives us the fall in the temperature of water at temperature T1. ∆T∆tis the rate of change of temperature difference. Two bodies of masses m1 and m2 and specific heat capacities s1 and s2 are connected by a rod of length l, cross-sectional area A, thermal conductivity K and negligible heat capacity. The whole system is thermally insulated. At time t = 0, the temperature of the first body is T1 and the temperature of the second body is T2 (T2 > T1). Find the temperature difference between the two bodies at time t.
Heat loss by the body at temperature T2 is equal to the heat gain by the body at temperature T1. m2s2(T2-T2′)=KA(T2-T1)l∆t⇒T2’=T2-KA(T2-T1)l(m2s2)∆tThis gives us the fall in the temperature of the body at temperature T2. An amount n (in moles) of a monatomic gas at an initial temperature T0 is enclosed in a cylindrical vessel fitted with a light piston. The surrounding air has a temperature Ts (> T0) and the atmospheric pressure is Pα. Heat may be conducted between the surrounding and the gas through the bottom of the cylinder. The bottom has a surface area A, thickness x and thermal conductivity K. Assuming all changes to be slow, find the distance moved by the piston in time t.
dQdt=KATs-T0xFor a monoatomic gas, pressure remains constant. Assume that the total surface area of a human body is 1.6 m2 and that it radiates like an ideal radiator. Calculate the amount of energy radiated per second by the body if the body temperature is 37°C. Stefan constant σ is 6.0 × 10−8 W m−2 K−4. Calculate the amount of heat radiated per second by a body of surface area 12 cm2 kept in thermal equilibrium in a room at temperature 20°C. The emissivity of the surface = 0.80 and σ = 6.0 × 10−8 W m−2 K−4. A solid aluminium sphere and a solid copper sphere of twice the radius are heated to the same temperature and are allowed to cool under identically surrounding temperatures. Assume that the emissivity of both the spheres in the same. Find the ratio of (a) the rate of heat loss from the aluminium sphere to the rate of heat loss from the copper sphere and (b) the rate of fall of temperature of the aluminium sphere to the rate of fall of temperature of the copper sphere. The specific heat capacity of aluminium = 900 J kg−1°C−1 and that of copper = 390 J kg−1°C−1. The density of copper = 3.4 times the density of aluminium. A 100 W bulb has tungsten filament of total length 1.0 m and radius 4 × 10−5 m. The emissivity of the filament is 0.8 and σ = 6.0 × 10−8 W m−2K4. Calculate the temperature of the filament when the bulb is operating at correct wattage. Energy radiatedTime=e·AσT4Here, e is the emissivity of the tungsten and σ is Stefan’s constant. A spherical ball of surface area 20 cm2 absorbs any radiation that falls on it. It is suspended in a closed box maintained at 57°C. (a) Find the amount of radiation falling on the ball per second. (b) Find the net rate of heat flow to or from the ball at an instant when its temperature is 200°C. Stefan constant = 6.0 × 10−8 W m−2 K−4. A spherical tungsten piece of radius 1.0 cm is suspended in an evacuated chamber maintained at 300 K. The piece is maintained at 1000 K by heating it electrically. Find the rate at which the electrical energy must be supplied. The emissivity of tungsten is 0.30 and the Stefan constant σ is 6.0 × 10−8 W m−2 K−4. A cubical block of mass 1.0 kg and edge 5.0 cm is heated to 227°C. It is kept in an evacuated chamber maintained at 27°C. Assuming that the block emits radiation like a blackbody, find the rate at which the temperature of the block will decrease. Specific heat capacity of the material of the block is 400 J kg−1 K−1. It is given that a cube behaves like a black body. A copper sphere is suspended in an evacuated chamber maintained at 300 K. The sphere is maintained at a constant temperature of 500 K by heating it electrically. A total of 210 W of electric power is needed to do it. When the surface of the copper sphere is completely blackened, 700 W is needed to maintain the same temperature of the sphere. Calculate the emissivity of copper. Let the emissivity of copper be e.
When the surface of the copper sphere is completely blackened, 700 W is needed to maintain the temperature of the sphere. A spherical ball A of surface area 20 cm2 is kept at the centre of a hollow spherical shell B of area 80 cm2. The surface of A and the inner surface of B emit as blackbodies. Both A and B are at 300 K. (a) How much is the radiation energy emitted per second by the ball A? (b) How much is the radiation energy emitted per second by the inner surface of B? (c) How much of the energy emitted by the inner surface of B falls back on this surface itself? A cylindrical rod of length 50 cm and cross sectional area 1 cm2 is fitted between a large ice chamber at 0°C and an evacuated chamber maintained at 27°C as shown in figure (29-E12). Only small portions of the rod are inside the chamber and the rest is thermally insulated from the surrounding. The cross section going into the evacuated chamber is blackened so that it completely absorbs any radiation falling on it. The temperature of the blackened end is 17°C when steady state is reached. Stefan constant σ = 6 × 10−8 W m−2 K−4. Find the thermal conductivity of the material of the rod. One end of a rod of length 20 cm is inserted in a furnace at 800 K. The sides of the rod are covered with an insulating material and the other end emits radiation like a blackbody. The temperature of this end is 750 K in the steady state. The temperature of the surrounding air is 300 K. Assuming radiation to be the only important mode of energy transfer between the surrounding and the open end of the rod, find the thermal conductivity of the rod. Stefan constant σ = 6.0 × 10−8 W m−2 K−4. A calorimeter of negligible heat capacity contains 100 cc of water at 40°C. The water cools to 35°C in 5 minutes. The water is now replaced by K-oil of equal volume at 40°C. Find the time taken for the temperature to become 35°C under similar conditions. Specific heat capacities of water and K-oil are 4200 J kg−1 K−1 and 2100 J kg−1 K−1 respectively. Density of K-oil = 800 kg m−3. A body cools down from 50°C to 45°C in 5 mintues and to 40°C in another 8 minutes. Find the temperature of the surrounding. Let the temperature of the surroundings be T0°C. A calorimeter contains 50 g of water at 50°C. The temperature falls to 45°C in 10 minutes. When the calorimeter contains 100 g of water at 50°C, it takes 18 minutes for the temperature to become 45°C. Find the water equivalent of the calorimeter. Let water equivalent to calorimeter be w.
q2 = w+100×10-3×4200×518From calorimeter theory, these two rates of flow of heat should be equal to each other. A metal ball of mass 1 kg is heated by means of a 20 W heater in a room at 20°C. The temperature of the ball becomes steady at 50°C. (a) Find the rate of loss of heat to the surrounding when the ball is at 50°C. (b) Assuming Newton’s law of cooling, calculate the rate of loss of heat to the surrounding when the ball rises 30°C. (c) Assume that the temperature of the ball rises uniformly from 20°C to 30°C in 5 minutes. Find the total loss of heat to the surrounding during this period. (d) Calculate the specific heat capacity of the metal. In steady state, the body has reached equilibrium. So, no more heat will be exchanged between the body and the surrounding. ∴ dQdt = P = 20 W(b) By Newton’s law of cooling, rate of cooling is directly proportional to the difference in temperature. (d) Net heat absorbed is used for raising the temperature of the body by 10°C. A metal block of heat capacity 80 J°C−1 placed in a room at 20°C is heated electrically. The heater is switched off when the temperature reaches 30°C. The temperature of the block rises at the rate of 2°C s−1 just after the heater is switched on and falls at the rte of 0.2 °C s−1 just after the heater is switched off. Assume Newton’s law of cooling to hold. (a) Find the power of the heater. (b) Find the power radiated by the block just after the heater is switched off. (c) Find the power radiated by the block when the temperature of the block is 25°C. (d) Assuming that the power radiated at 25°C represents the average value in the heating process, find the time for which the heater was kept on. H=s×∆T=80×(30-10)=800 J Rate of rise in temperature of the block=dθdt = 2°C/sRate of fall in temperature of the block=dθdt = -0.2°C/sThe negative sign indicates that the temperature is falling with time. (b) Power Radiated = Energy lost per unit time. dθdtrepresents the rate of decrease in temperature. (c) 16 W of power is radiated when the temperature of the block decreases from 30°C to 20°C. dθdt=-kθ-θ0. Its temperature at t = 0 is θ1. The specific heat capacity of the body is s and its mass is m. Find (a) the maximum heat that the body can lose and (b) the time starting from t = 0 in which it will lose 90% of this maximum heat. (b) If the body loses 90% of the maximum heat, then the fall in temperature will be θ.